SAIED, S. A., ABBASZADEH, K.
In this paper, two new methods for the stator skew are introduced. In contrary with the conventional stator skew, this paper is concentrate on the slot-opening skew. The simula-tion result by finite element shows a considerable reduction in the cogging torque of the motors, the new methods are applied to. Moreover the simulations justify that the back-EMF shape remains trapezoidal for various skew angles in contrary with that in the conventional skew, this fact makes the method highly applicable in BLDC motors. Slot opening optimization of surface mounted permanent magnet motor for cogging torque reduction, Abbaszadeh, K., Rezaee Alam, F., Teshnehlab, M., Energy Conversion and Management, ISSN 0196-8904, Issue , 2012. Cogging torque reduction of permanent magnet synchronous motor using multi-objective optimization, Ilka, Reza, Alinejad-Beromi, Yousef, Yaghobi, Hamid, Mathematics and Computers in Simulation, ISSN 0378-4754, Issue , 2018. Optimal Design Solutions for Permanent Magnet Synchronous Machines, TUDORACHE, T., POPESCU, M., Advances in Electrical and Computer Engineering, ISSN 1582-7445, Issue 4, Volume 11, 2011. Reduced Order Model of Developed Magnetic Equivalent Circuit in Electrical Machine Modeling, Saied, Seyed Amin, Abbaszadeh, Karim, Fadaie, Mehdi, IEEE Transactions on Magnetics, ISSN 0018-9464, Issue 7, Volume 46, 2010. Cogging torque optimization in surface-mounted permanent-magnet motors by using design of experiment, Abbaszadeh, K., Rezaee Alam, F., Saied, S.A., Energy Conversion and Management, ISSN 0196-8904, Issue 10, Volume 52, 2011. Experimental Identification and Reduction of Acoustic Noise in Small Brushed DC Motors, Cavagnino, Andrea, Saied, Seyedamin, Vaschetto, Silvio, IEEE Transactions on Industry Applications, ISSN 0093-9994, Issue 1, Volume 50, 2014. Analytical and FEM approach to reduce the cogging torque in in-wheel motors, Gotovac, Gorazd, Detela, Andrej, Lampič, Gorazd, Valentinčič, Joško, Electrical Engineering, ISSN 0948-7921, Issue 4, Volume 97, 2015. 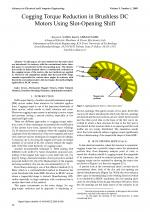 Design Solutions for Reducing the Cogging Torque of PMSM, TUDORACHE, T., MODREANU, M., Advances in Electrical and Computer Engineering, ISSN 1582-7445, Issue 3, Volume 13, 2013. Rotor Pole Shape Optimization of Permanent Magnet Brushless DC Motors Using the Reduced Basis Technique, JABBARI, A., SHAKERI, M., GHOLAMIAN, A. S., Advances in Electrical and Computer Engineering, ISSN 1582-7445, Issue 2, Volume 9, 2009. New Approach to Cogging Torque Simulation Using Numerical Functions, Saied, Seyed Amin, Abbaszadeh, Karim, Tenconi, Alberto, Vaschetto, Silvio, IEEE Transactions on Industry Applications, ISSN 0093-9994, Issue 4, Volume 50, 2014. Skewing effect on interior type BLDC motors, Donmezer, Y., Ergene, L.T., The XIX International Conference on Electrical Machines - ICEM 2010, ISBN 978-1-4244-4174-7, 2010. New approach to cogging torque simulation using numerical functions, Saied, S., Abbaszadeh, K., Tenconi, A., Vaschetto, S., 2011 IEEE International Electric Machines & Drives Conference (IEMDC), ISBN 978-1-4577-0060-6, 2011. Torque ripple reduction using magnet pole shaping in a surface mounted Permanent Magnet BLDC motor, Upadhayay, Pranshu, Rajagopal, K. R., 2013 International Conference on Renewable Energy Research and Applications (ICRERA), ISBN 978-1-4799-1464-7, 2013. Experimental identification and reduction of acoustic noise in small brushed DC motors, Boglietti, Aldo, Cavagnino, Andrea, Saied, Seyedamin, Vaschetto, Silvio, 2012 XXth International Conference on Electrical Machines, ISBN 978-1-4673-0142-8, 2012. Design and torque optimization of a PM Synchronous Motor, using an auxiliary winding, Maroufian, S. Sara, Abbaszadeh, Karim, The 5th Annual International Power Electronics, Drive Systems and Technologies Conference (PEDSTC 2014), ISBN 978-1-4799-3479-9, 2014. Low cost solutions to reduce cogging torque and acoustic noise of small brushed DC motors for automotive radiator Cooling Fan Modules, Boglietti, Aldo, Cavagnino, Andrea, Tenconi, Alberto, IECON 2012 - 38th Annual Conference on IEEE Industrial Electronics Society, ISBN 978-1-4673-2421-2, 2012. Study of switching flux permanent magnet machines using interpolation based reluctance network model, Benhamida, Mohammed Ali, Ennassiri, Hamza, Amara, Yacine, Barakat, Georges, Debbah, Nabih, 2016 International Conference on Electrical Sciences and Technologies in Maghreb (CISTEM), ISBN 978-1-5090-4947-9, 2016. 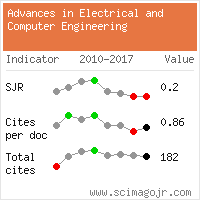 A Study on the effect of PM machine design parameters changes on performance measures, Sarikhani, Ali, Saint-Hilaire, Wilder, Mohammed, Osama A, IEEE PES General Meeting, ISBN 978-1-4244-6549-1, 2010. A practical approach to cogging torque reduction in a Permanent Magnet Synchronous Motor using Non-dominated Sorting Genetic Algorithm, Hemmati, S., ShokriKojoori, Sh., Ghobadi, R., Ghiasi, M. I., 4th Annual International Power Electronics, Drive Systems and Technologies Conference, ISBN 978-1-4673-4484-5, 2013. Website conception, design and maintenance by Eugen COCA. Content updated on 28 Feb 2019. Site engine updated on 28 Feb 2019. This page was generated on the server in 0.087 seconds and loaded in your browser in > seconds.